The entrée system provides hundreds of reports with the ability to customize each report to the exact layout that suits your needs best. You can specify columns, sort orders, filters, insert your company logo, print barcodes, change fonts, save configurations for re-use, email, fax, export to different file formats and so much more. Our latest report generation tool is called Re4, which our fourth generation reporting engine. The entrée system also includes a powerful Report Scheduling Utility, which allows you to setup times for specific reports to be automatically generated. This is a great time and human resource saving tool. To learn more about the Report Scheduling Utility, click here. 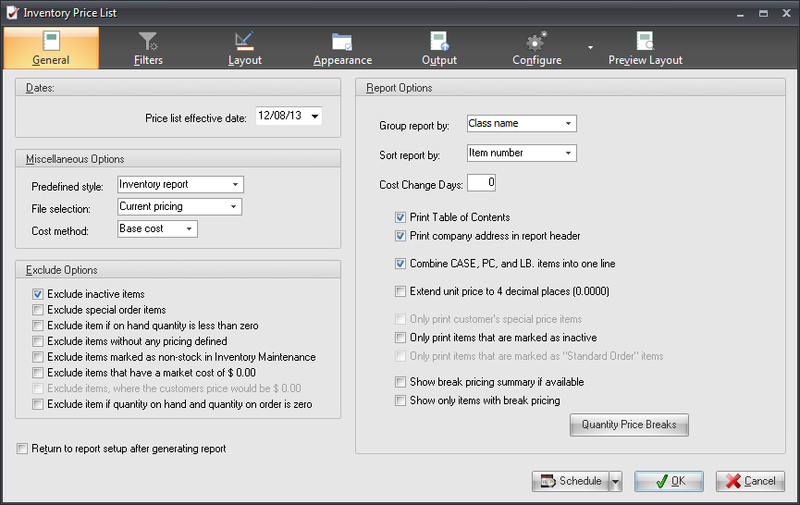 After selecting the type of report you wish to generate, such as a Price List, the Re4 report generation system will allow you to customize basic or general features about the report. These features will change from report to report. However, you can normally change features here such as a date range, pre-defined style, cost method for generating gross profit information, inclusion or exclusion of specific criteria as well as sorting and grouping options. The Filters tab of the Re4 reporting system allows you define specific information from either be included or excluded on the report. This allows you to define exactly the amount of data generated. All of the possible key fields for the specific report style are included with an easy search feature to help you find exactly what you need. 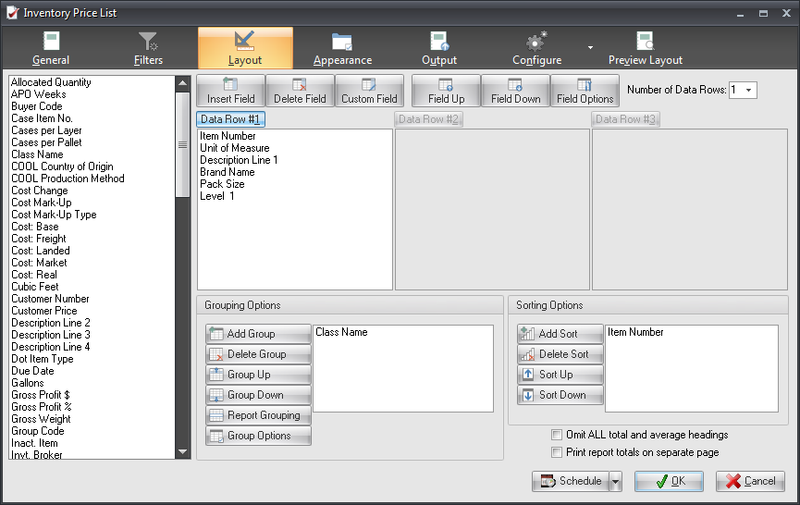 The Layout tab is used for configuring which data fields (columns) will appear on the report, with the option of stacking up to three rows per column for the maximum information on a page. 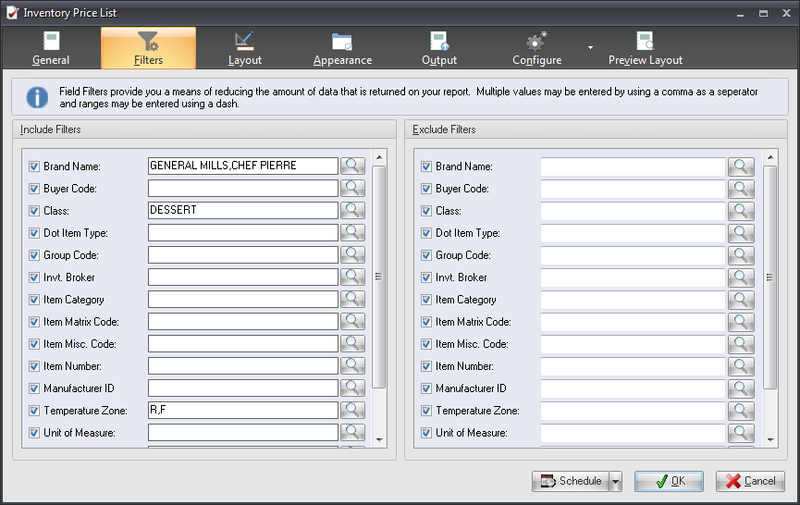 All of the available data columns are included, with some report styles showing more than 100 columns available. Report grouping and sorting can also be configured on the layout page. Totals and averages will print beneath each grouping, if applicable. Making your report look as visually attractive as possible in controlled via the Appearance tab. Here you can configure the fonts that should be used on the report as well as the report margins and custom header text. You can define column shading, double spacing and using a double column format. You can also include your company's logo, add up to 3 lines of custom header text and define page margins as well as orientation (Landscape or Portrait). 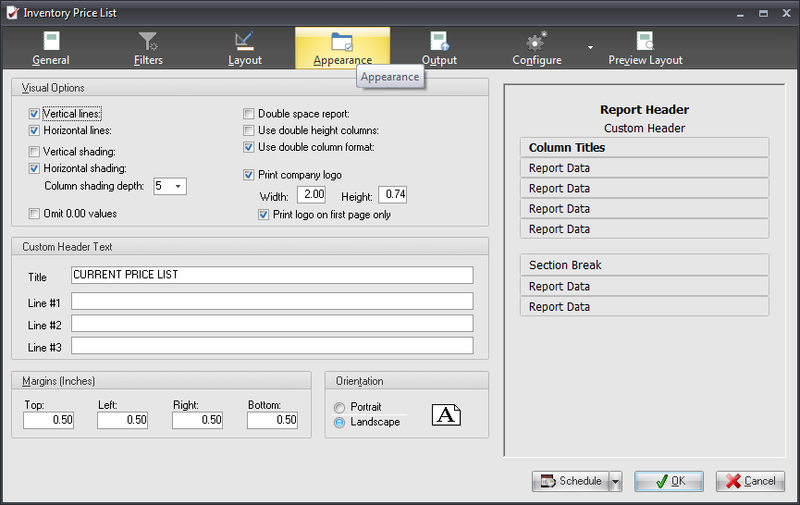 The Output tab is where you can specify a location the report can be sent to. This could be the printer, email, fax, a preview to the monitor, or saved to a file in one of many popular formats including Adobe Acrobat PDF, HTML document, RTF (Rich Text Format), Excel, Delimited Text, GIF, JPG or Bitmap. 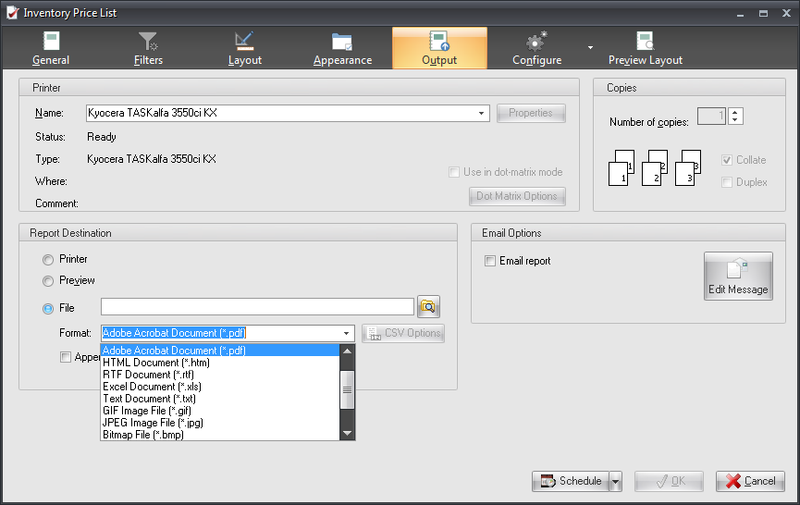 When selecting to email a report you can modify the subject, body, and recipient list. Some reports such as Order Forms and Price Lists may be 'batch' emailed. This allows you to generate these reports at a scheduled point during the week or month and have them automatically emailed to your customers with the proper customer specific information. The Configure tab is used to save or recall a report configuration. In addition, report configurations may also be imported, exported, and locked from this page. 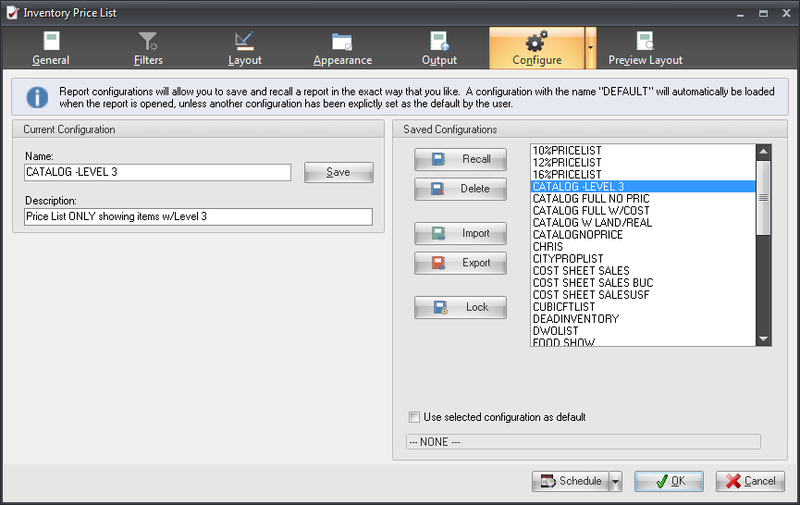 Every user of entrée can define any configuration to be their default configuration for the report. Note that "locking" a report will prevent someone from accidentally overwriting an important configuration. The locking mechanism for the report configurations requires the user to enter a password. Whenever a user subsequently attempts to modify or delete a locked configuration, they must first provide the lock password. 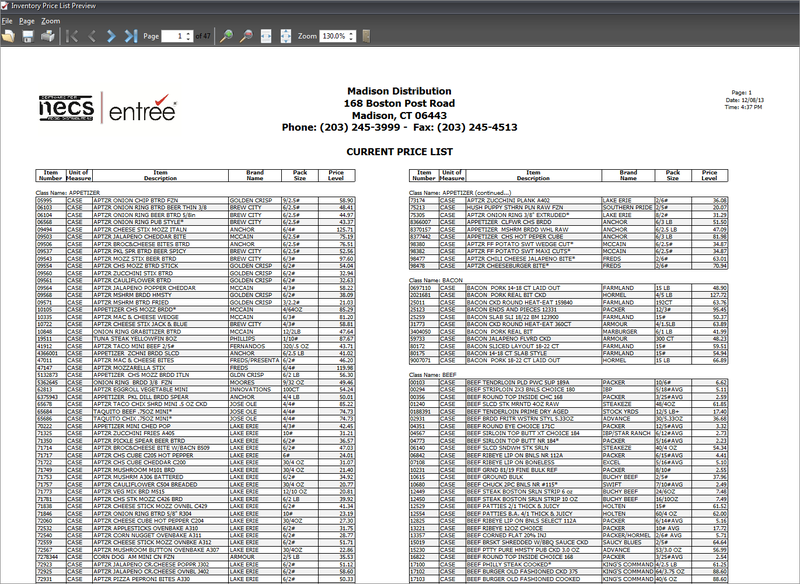 The entrée reporting system allows you to print a variety of different label styles including printing an actual barcode for any data field on the label or report. For example, when generating a Price List report, you can choose to have an actual UPC barcode printed next to each item. 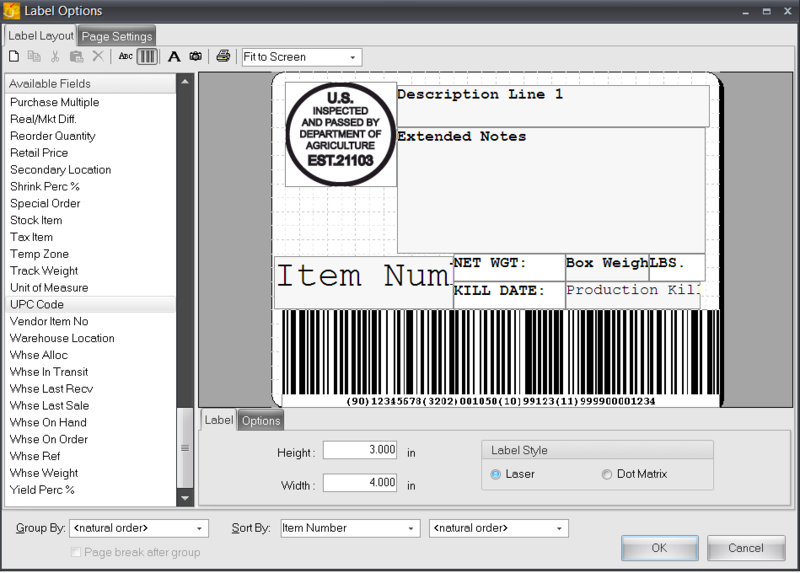 Or when generating Picking Labels for the warehouse, a barcode can be printed for any data field. Supported barcode symbologies include: UPC-A, Code 39, Code 128, Code 2 of 5, Code 93, MSI, Postnet, Codabar, EAN 8, EAN 13, EAN 128 and GS1-128. When it comes to the types of reports you can generate in entrée, you'll find there is no shortage of styles to suit your exact needs. Refer to the table below for an idea of the many reports available, and remember that each has hundreds of customizable options.